With the Windows XP support deadline looming for millions of computers around the world, the latest desktop operating system market share figures show users are still adopting Windows 8 at a very slow pace. In Windows 8.1’s fifth full month of availability, the operating system managed to stake a 4.89% market share, up 0.59% from February’s numbers. Windows 8 usage only increased to 6.41%, just a 0.03% climb from February. 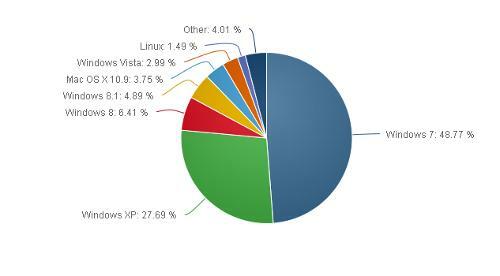 With Windows 8 and 8.1 combined, the market share they both get is 11.3%, up just 0.6% from February’s 10.68% foothold. Adding to the slow adoption is the trickle of users moving away from Windows XP. Between February and March, the 13-year-old operating system only saw a 1.84% drop in desktop market share, ending up at 27.69%. Meanwhile, Windows 7 dropped 1.46%, down to a 47.31% market share from 48.77%. March’s figures highlight the problem Microsoft is facing in getting users to Migrate to Windows 8. On April 8, official security support for Windows XP will cease to exist, and the poor grip of Windows 8 on the desktop market is only adding to the crisis. Yesterday CBR revealed that 99% of London’s Met Police computers were still running XP, and will still be running it after the 8 April deadline. A further report by Appsense has found that over three quarters of UK organisations will still have Windows XP running somewhere in their IT estate after the deadline in a weeks time. The survey, of 100 UK IT decision makers, also showed that organisations had no plans to pay for extended support, which comes at a high cost for users. Microsoft will be charging £120 per PC for extra security support, with that cost increasing to £240 in the second year and £490 in the third year. Simon Townsend, chief technologist, AppSense EMEA, said: There seems to be a lack of concern amongst UK organisations around the possible dangers of running XP after April 8th. "Part of the reason for lack of concern would appear to be the low level of dependency currently on the XP operating system. While it is still present in many organisations, the numbers would suggest that it is very much on the periphery. "It might be the case that an XP machine is running a print server, or some other application which is not entirely obvious. The reality is though, that one machine could potentially put an entire network at risk and without adequate protection it could be a step into the unknown for UK businesses.